Up until level 10 we were running out of ranks & levels before we ran out of quests to run. We could pick and choose which quests we wanted to skip and still level without any problem (and the XP bonus helped too!). We have even had to run a few quests over level in order to finish the chain (Delera springs to mind – we finally made the effort to get an extra Voice of the Master & Mantle of the Worldshaper to get that augment crafted). This is just a quick funny. Like all guilds, I suppose, that contain friends, we take the piss out of each other 😛 This week I’ve been telling my guildie Aldrac that he looks like Kermit the Frog. What do you think? Unfortunately, one of the guildies is having issues with his ISP. He has lost his internet and doesn’t expect it to be back for a few weeks. As we TR’d our characters as a whole guild, it seems a bit unfair for us to keep playing them while he’s not around. Last night, we ran with our second lot of TR’s. That is my fighter and my partners clonk. The whole idea of TR’ing these characters was to play them when nobody else was around. 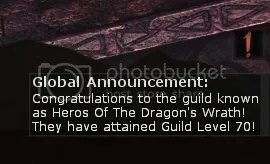 So I don’t feel guilty about playing them while my guildie gets himself sorted out. One of our other guildies jumped on with his druid and we had fun running Tear of Dhakaan with his ‘pack’.